This photograph is yet another from my dusty collection, taken by an unknown photographer. 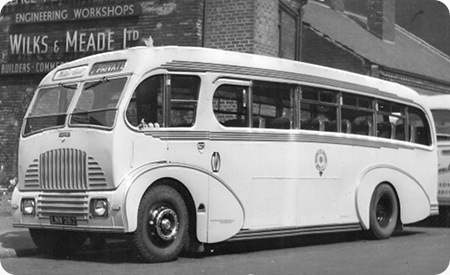 It shows Wallace Arnold LNW 262, one of a large batch of Leyland PS1s purchase in the immediate post-war years to get a head start on the newly-emerging leisure and coaching market. It was bought in 1947 with a Burlingham C33F half-cab body. In 1950, following the trend towards "modernisation", it reappeared as an FC33F. At the time, WA were constantly swapping bodies and rebodying chassis to create an up-to-date image at the lowest cost, so I’m not sure if this was a completely new body or simply a rebuilt front end. If it was a new body, what happened to its 3-year old original body? It was withdrawn in 1957 and saw further service with Wilsons of Hunwick, Prospect of Ferryhill, McClean of Govan and finally to Austins of Stafford in 1963 where it seems to have joined its sister LNW 263. The only sure thing about this photo is the location – the WA depot and workshops, Chadwick Street, Leeds. I’m sorry, but I’ve always preferred the half-cab version of this body. It just looks better. This "grinning" style looks to have been taken as the inspiration for those ‘smiley’ characters which appear on the forum sections of some websites. Was this style of front end some form of inspiration for that variant of the Seagull which appeared on Bedford SB coaches? If that’s a conversion it’s been done very neatly! Interesting to note the sign in the background, as Wilks and Meade were coachbuilders themselves! I cant argue with that, Pete. Just one point, some of Northern’s Beadle re-bodies didn’t have a bulkhead behind the driver, but its hard to tell if this one does or not, it may only be a half one, in which case the object of the exercise may have been to leave the passengers feeling less cut off from the driver, that said, I still don’t like it. My opinion of these sacrilegious "facelifts" intended to deceive the customers in some way is unprintable on a refined Forum like this one. Samuel Ledgard bought a batch of eight most handsome PS1 Tigers with Duple "porch entrance" bodies in 1948. 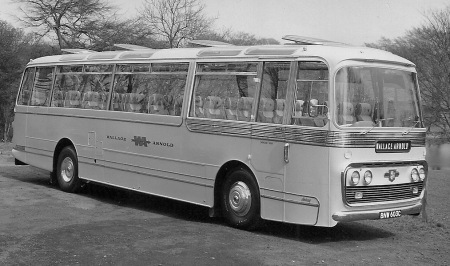 During the madness years of the 1950s these beautiful coaches were subjected to this indignity by the Samlesbury Engineering Company – the first to be treated, LUB 675, was the worst – with small rectangular windscreens with level lower edges – absolutely awful. Also, in the marketing "spin" frenzy, operators appeared completely oblivious to the maintenance difficulties and to the misting of windscreens which came with these "improvements." Wilkes and Meade were a Leeds firm who were bought by Wallace Arnold. They were then set to work on the convoluted post war bodying, re-bodying and partial re-bodying programme (putting full fronts on half cabs). They built many new coaches in the late forties – some for outside customers, and also some buses for Sheffield Corporation. They were finally integrated into Wallace Arnold’s maintenance division and the name disappeared into obscurity. This looks like a completely new body to me. The trim above and below the windows, and around the wheel arches, belong to the same style of body as the front end, not to the half-cab style. If it is a conversion then it’s a wholesale update, not just a front-end job. Incidentally the trim above and below the windows was carried forward to the Seagull. Notwithstanding the impracticalities of full-fronted designs that Chris mentions, but just accepting that it was just the ‘done thing’ at the time, I rather liked the Burlingham ‘SunSaloon’. The grille was a touch flashy and garish I know – so were very many other coach builders’ features in the early fifties – but I always thought that these were very neatly shaped at the front, just as their half cabs had been. Whilst most of us are traditionalists and would much more prefer halfcabs, I think one can understand why coachbuilders turned to full-fronts and full-front rebuilds in the circumstances of the time – it’s just that so many made a dog’s breakfast of the job. This was a new body, a Burlingham Sun Saloon built in 1950. The original body was transferred to a prewar Leyland or AEC as part of the modernisation programme. Wilks & Meade supplied WA with a total of 40 bodies on new and recon chassis in the period 1946-1950, as well as carrying out a good deal of refurbishment and rebuilding work for the operator. A small number of bodied were also built by Wilks & Meade for other concerns. Quite why this coach was at Wilks & Meade’s premises is not clear, one supposes it had been receiving some attention to its body. Excellent observations, gentlemen, thank you. Philip, the Wilks & Meade sign was attached to the side of WA’s workshop/office/canteen building and the Wilks & Meade workshop was further up Chadwick Street. WA’s large depot had entrances from Chadwick Street and the parallel Sayner Road, so this coach was probably parked awaiting duty or mechanical attention. When WA moved to Donisthorpe Street as a (long-term) temporary measure, prior to the completion of their Tour Terminal, depot and workshops in Gelderd Road, this whole site was taken over by Wallace Arnold Sales & Service, a Vauxhall main dealership – and is now owned by Evans Halshaw. You can still see the footprint of the old depot on Google. In my time with WA (mid 60s) there was only one chap still employed from the Wilks & Meades days, a very fine man called Jack Lye, who was obviously much used for body repairs etc. I can still see him walking up the street carrying long lengths of beading to be cut, drilled and applied to some accident damaged coach. Looks to me as if a complete Plaxton Consort front up to and including the cab window, not just the grille, has been skilfully grafted on. Presumably this was supplied by Plaxton. Makes for an interesting combination! Thurgood also produced some bodies (usually on Bedford SB chassis) in the late 1950s/early 1960s which used an almost identical "Plaxton Venturer" front. I also seem to recall that Dodd of Troon (AA Motor Services) had a Foden PVSC6 with a very similar full front rebuild, although this may have originally been bodied, as a half-cab, by Burlingham. My copy of the Foden chassis list is out on loan at the moment, so I can’t check this. Are there no old-time Plaxton employees on this website who might clarify the reason for all these Venturer lookalikes? Is the result of the grafting known as a "Duplax"? The fitting of the new front end end was done in 1954. 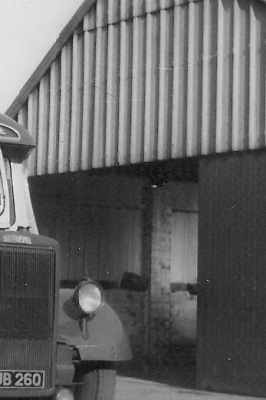 From 1952 WA began ordering coach bodies from Plaxton, Plaxton would have been keen to retain their business. Although the work is described as Wilks and Meade to Plaxton design, most, if not all the components must have been supplied by Plaxton. Wilkes and Meade had previously done similar conversions to Yeates design at the same time as Yeates had converted some of WA’s coaches themselves-was this an exercise in keeping Wilks and Meades workshop occupied between car related jobs? As mentioned, Wallace Arnold’s rebodying and rebuilding programme in the late 40s/early 50s was complex, and is documented in PSV Circle publications. In fact the featured coach, LNW 262, was one of four in a chain of body changes. (1) LNW 262, as has been mentioned, was a 1947 Leyland PS1 with Burlingham half cab C33F body, which it carried till winter 1952/3. (2) HUA 904, a 1939 Leyland TS8 then received the half cab Burlingham body from LNW 262. (3) APT 464, formerley Wilkinson’s of Sedgefield, was fitted with the 1939 Duple C32F from HUA 904 by Comberhill Motors (dealer). (4) NUA 753 was a 1950 Leyland PS2/3/Burlingham FC33F whose body was then transferred to LNW 262 to produce the coach depicted. Its chassis then went to Plaxtons for a new Venturer FC35F8 body. David, many thanks for the comprehensive body juggling information. As mentioned in other threads and discussions, WA were very money conscious and never failed to spot a bargain when one arose, and they must have calculated that these complex activities were worthwhile. The strange thing is, I doubt if Mr & Mrs Tourist would have been too bothered about touring in a half-cab or a full-front as long as the seats were comfy and the price was right. Interesting point, Paul. It is well known that as soon as underfloor engined coaches made their appearance, halfcabs were considered dead in the water. Despite the regulated environment there was still real competition in the coaching world, and operators could not bear to see a rival operator with more up-to-date stock than they had. And yet, as you say, this may actually have had very little to do with their customers. My family only used coaches for excursions, but I’m quite sure my parents never noticed which of the Albions used by our local operator had full fronts and which were halfcabs. I did of course, but then at the age of 8 I was already a bus freak! Regarding Jack Lye from Wilks and Meads (03/10/12 above), there was a George Lye who used to work occasionally in the WA Gelderd Road bodyshop when he was well into his eighties. He loved the job, and was ex Wilks and Meads – could they be the same man? I was at WA 1978 to the end in 2005. Jon – George it was! Thanks for that memory jog. Pleased to learn that he was still involved with WA so late on. Every time I pass the Gelderd Road "wasteland" I can’t believe how such a comparatively modern hive of activity could have disappeared so quickly. As you were there to the "bitter end", you must share those sentiments. How are the mighty fallen! This photo is another from my dusty collection of postcards bought many years ago, and recently extracted from the proverbial shoebox. 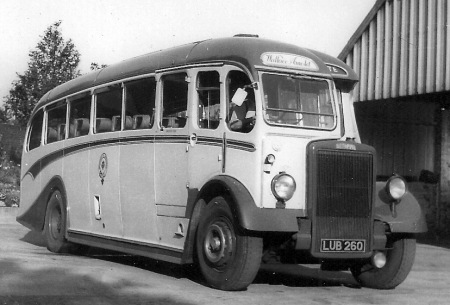 This view of Wallace Arnold coach LUB 260 was taken by an unknown photographer sometime in the mid-1950s, and might possibly have been at their Paignton depot (confirmation would be appreciated please). Amazingly, on the back of this photo I have written its subsequent history, although where I got the information from is a mystery, On being withdrawn by WA in 1958 it went to Ward Brothers of Lepton (Huddersfield). In 1960 it was sold to Mitchell’s of Luthermuir, presumably to join their existing fleet of red and cream PS1 coaches – see this link – Its last known move was to contractors Haley of Cleckheaton (West Yorkshire) in 1962, and was presumably scrapped soon after. Quite a well-travelled coach even after its glorious WA days. Looks like the frontage of Royston depot – but I stand to be corrected . . .
There’s a picture of this coach in "Holidays By Coach" an illustrated history of Wallace Arnold, by Stewart J Brown. The caption states it was rebuilt with a full front in 1954. In the same book is a photo of Royston depot taken in 1948 and there are detail differences in the asbestos style cladding to the building. Yes R. T. Haley of Hillside Works Hunsworth Cleckheaton. I remember them having this coach painted bright yellow and as stated fitted with a full front. I don’t think the company is still in business. Anybody have a photo of LUB 260 after rebuilding to full front? The full front coach would surely never have looked as good as the original did. What a great photograph…I really enjoy looking at these old buses and coaches…and wishing I had a time machine!! Too true Norman – these full front conversions of the early 1950s always looked "unhappy", and the process turned the interiors of the driving cabs into a nightmare of noise and condensation – and as with all these "consultant led" schemes fooled nobody – the public aren’t dense, but sadly even today operators seem to think that they are – age disguised re-registrations etc – bah humbug !! Samuel Ledgard had a batch of truly beautiful looking PS1/Duple half cabs in 1948 – classic is the word – and had them "full fronted" – ever after they looked simply awful and caused we devotees much displeasure. Yet again, I find myself agreeing with Ebenezer Youhill. With the possible exception of the "Regent V" version, I always preferred exposed radiators as well. I’m always glad of the support of our wise colleague David Cratchett Oldfield in these matters – I might just consider relenting my nature and let him have Christmas Day off with pay this year !! …..with a whole goose, not just a pigeon! LUB 260 rebuilt with full front by Wilkes and Meade to Plaxton design in 1/54. Thank you for all these wonderful comments. Immensely useful to me as I write about my childhood memories of going to Blackpool Illuminations in the 1950s. I just wish there was a shot of the inside of the coach as I can’t remember where you stored your mackintosh and bag, did they have overhead racks or nets? Anyway, lovely stuff and great memories, thanks. 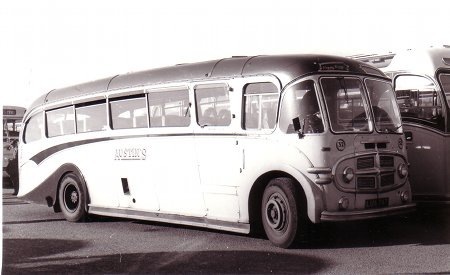 BNW 603C was one of the 1965 batch of Leyland Leopards with WA’s specified centre-entrance Plaxton Panorama bodies. This is an official publicity photograph taken at Roundhay Park, Leeds immediately after delivery. Judging by the trees, it must have been taken in early April (it’s documented delivery month), and I suspect that the roof lights would soon have been closed after the photographs were taken. Perhaps this coach was to be entered in the 1965 Blackpool and Brighton Coach Rallies, so the non-standard chrome wheel trims would be retained until after the events, and then removed in favour of the standard red paint trim. As a final observation, why has this "Panorama" got the "Embassy" badge attached to the front off-side panel? …..because it IS an Embassy and not a Panorama! The Panorama has fixed windows and forced air ventilation, The Embassy has (multiple) slider vents and no forced air ventilation. This, along with centre entrances, was a WA special specification for years. This was Plaxton emerging into it’s high point in history. Regrettably, wooden frames – common on all coach bodies – means that few coaches have survived into preservation compared with service buses. A most interesting feature Paul from our days at WA – I was unaware of all these finer details about Plaxton/WA specifications and trim. I’ve just hurried to my records and find that I never encountered this coach, but I did drive three others of the batch. I can well see the wisdom of removing the fancy wheel trims promptly, as the heavy Leopards were short on braking stamina as is well known, and any extra optional heat build up was not to be recommended. BNW 603C was indeed WA’s entry in the 1965 Blackpool Coach Rally, driven by Eric Patrickson. They also entered BNW 633C, a Ford 676E/Duple C51F from the Feather fleet. But WA did not enter any coaches in the Brighton Rally. One of this batch the number which is lost in the shadow of time was rebodied and reregistered by Stanley Gath Coaches of Dewsbury. Perhaps someone remembers its new identity. You’re right, David, muddy waters indeed, and I’m sure you are technically correct in what you say. However, to me – if they have panoramic windows, they are Panoramas. The last of the "official" WA Embassys in 1962, albeit stretched to 36ft, had small windows and a bulbous front and rear – totally unlike a Panorama. I now discover that WA’s 1963 and 64 intake of coaches with Panorama-like bodies were also badged as Embassys. What is even more strange is that, according to Plaxton history, the Embassy style was designed for lightweight chassis, even though the lightweight VAMs and VALs of the same period had "official" Panorama bodies! Thankfully, common sense seemed to prevail and the name Panorama-1 became universal for this style of bodywork, albeit with a front-entrance. …..and talking of special WA specifications…..
Woodgrain veneer/formica was the normal finish on both Duples and Plaxtons in the ’60s – which got darker and darker as the decade progressed. The exceptions were these self same WA centre entrance specials which had a very light non standard finish. I never rode on any but "observed" many on holidays in Devon and Cornwall. My hazy memory recalls a light greeny/grey hue with sunshine motifs – but whatever it was, it was unique to WA. The point is that from the 1963 season onwards, ALL 36-foot Plaxton bodies had long windows, but not all 36-foot Plaxton bodies were Panoramas. All the evidence says that until the introduction of the Panorama II, the Panorama was fiercely protected as a premium product by the application of three rules: it must have fixed windows, it must have a front entrance and it must be on a heavyweight chassis. It’s strange how the space where the air scoop would have been doesn’t have a glazed quarterlight. Obviously it’s a coach which could be more than adequately ventilated, the trouble was, even on the coldest of days, there was always someone who wanted a window open! With regard to the name, don’t forget the Venturer appeared in several different forms but was it still the Venturer? The Embassys which Paul mentions with the bulbous front had a wonderful stately air about them (when fitted to underfloor engined chassis) the aristocrats of the road! 3. front engined with entrance behind front wheel. There were cases where these different versions had different windscreens and/or grilles, and once the Panorama got added to the mix, it took dedicated study to work out what was what. Having just seen a couple of photos of 1965 Bedford SBs with Panorama bodies (of the type later badged as Panorama I), I must modify slightly something I said above: it seems that the embargo on "lightweight" Panoramas was lifted with the Ogle restyling for the 1965 coaching season.